If your community is within .5 miles of unpopulated and undeveloped wildland, you live in the Wildland-Urban Interface, the WUI, as it is called in California. This WUI is the area where the communities and farms end and nature begins. The wildland urban interface covers approximately 40% of all new development in the United States, so four in ten new home owners are affected, and some may not know about it. Perhaps because their new neighborhood is tightly packed with newly built houses and roads, a sense of false security may take hold. This may happen whilst the nearest fire department is forty or more miles away and is responsible for containing fires hundreds of times larger than metro fire departments. As you may have guessed, the WUI is the zone of transition between wild and human occupied land. As it is human for us to forget, the natural landscape takes no fire precautions, especially in the summer when the temperatures go up. Millions of acres of highly flammable material surrounds the WUI in California alone, capable of creating ember attacks on buildings even ones with defensible space (as you may know, our fire-resistant vent is good for defense against ember attacks). Are we advocating staying away from the WUI? Absolutely not! Without a doubt some of the best places to live in the country are right smack in the middle of the wildland urban interface. That’s no reason at all to not live there, as long as you know to have defensible space and Vulcan Vents. To prepare your defensible space, clear at least 100 ft of brush, high grasses, shrubs, and small trees that would allow a wildfire to get a hold of your building, and ensuring any large tree branches stay trimmed so as they will not fall on your road or structure which could keep you from escaping. See a near real time graphical display of all the fires of the last 24 hrs anywhere in the world, here. 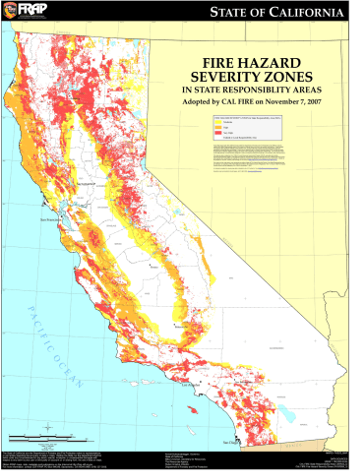 This map doesn't include the Sacramento Valley and other areas which are deemed 'locally responsibility areas', meaning the fires are the responsibility of local municipalities and counties. See where the highest fire hazards are in California by clicking the image above.